Adad-šuma-uṣur, inscribed dIM-MU-ŠEŠ, meaning "O Adad, protect the name!," and dated very tentatively ca. 1216–1187 BC (short chronology), was the 32nd king of the 3rd or Kassite dynasty of Babylon and the country contemporarily known as Karduniaš. His name was wholly Babylonian and not uncommon, as for example the later Assyrian King Esarhaddon (681–669 BC) had a personal exorcist, or ašipu, with the same name who was unlikely to have been related. He is best known for his rude letter to Aššur-nirari III, the most complete part of which is quoted below, and was enthroned following a revolt in the south of Mesopotamia when the north was still occupied by the forces of Assyria, and he may not have assumed authority throughout the country until around the 25th year of his 30-year reign, although the exact sequence of events and chronology remains disputed. There is surprisingly little contemporary evidence for this king considering the purported length of his reign, which was the longest recorded in the Kassite dynasty. The tablet known as King List A[i 2] shows him following Adad-šuma-iddina and his predecessor-but-one, Enlil-nadin-šumi, but in Chronicle P[i 3] he makes his appearance in the narrative before them. Brinkman argues that this is for stylistic purposes but the Walker Chronicle[i 4] suggests a simpler explanation. Adad-šuma-uṣur was elevated to the position of king in the south of the country years before he conquered Babylon and made himself its king. The early part of his reign may well have been concurrent with that of the three kings preceding him on King List A, but it is quite probable that he followed them in ascending the throne of the city of Babylon. It is a characteristic trait of this tablet that concurrent kings and dynasties are presented successively as if one followed another. 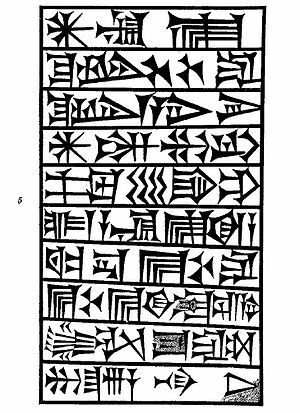 A late copy of an inscription on a bronze statue from Ur,[i 6] begins “When Anu and Enlil looked with steady favour on Adad-šuma-uṣur, the shepherd who pleased their heart, at that time Marduk, the great lord, named his name as ruler of (all) land[s],” supporting the theory that he reigned in Uruk and Nippur before being appointed by Marduk in Babylon. The brevity of his reign over Babylon proper also explains the minimal contemporary inscriptions found. Only sixteen dated economic or legal texts attest to his reign, with just two of them from Babylon, bearing the curious double-dating formula adopted by Adad-šuma-uṣur and his immediate successors. These are inscribed 7 KAM 3 KAM[i 7] and 9 KAM 3 KAM,[i 8] speculated to represent his 27th and 29th years. Twelve of the extant tablets have provenance from excavation at Ur. The earliest of these is dated[i 9] to his 3rd year and records that Šamaš-zēra-šubši had inspected and “plucked” 103 sheep. Much of the remainder concern cattle, their sale and the legal actions taken to secure recompense for their theft. The determination of innocence or guilt was often arbitrated by “river ordeal,” a process still poorly understood. In two documents,[i 10] the judge was Adad-šuma-uṣur, the šakkanakku, “appointee, governor,” a role similarly adopted by his predecessor Šagarakti-Šuriaš[i 11] and two other texts[i 12] feature the same group of miscreants, Abu-ṭābu, Zēru-kīnu and Sîn-pūtu, suspects in three separate cases of cattle rustling. The cities of Nippur, Dur, Isin and Marad had been sacked by the marauding Elamites under their king, Kidin-Hutran III, and two of these, Nippur and Isin were the subjects of construction work by Adad-šuma-uṣur. 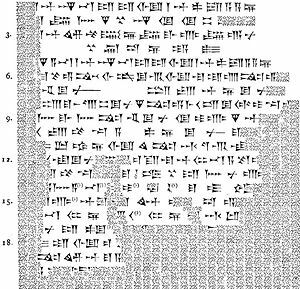 Bricks from Isin were excavated in 1975/76 with a Sumerian inscription recording his work on the Egalmaḫ and also earlier from Nippur recording work on the Ekur (example text pictured). He had been credited with rebuilding the walls of Nippur in the Walker Chronicle. Tukulti-Ninurta I, the king of Assyria, had captured Adad-šuma-uṣur's predecessor, Kaštiliašu IV, on one of his two campaigns and conquered Babylon during the second one, perhaps around 1225 BC. He had taken the Babylonian kingship and then ruled there probably through governors, for seven years. [i 3] There is an economic text[i 13] from Nippur dated to his accession year. When exactly the three native kings, Enlil-nādin-šumi, Kadašman-Ḫarbe II and Adad-šuma-iddina succeeded one another is still uncertain, but their short reigns totalled around nine years. Yamada, for example, argues that Tukulti-Ninurta only ascended the Babylonian throne after their reigns. Others place his rule before them, or propose the first two ruled in the two-year period between Tukulti-Ninurta’s two campaigns. Walker suggest that after them, it seems likely that Tukulti-Ninurta’s successors appointed governors over Babylon until they fled in the face of Adad-šuma-uṣur’s triumph over the Assyrian king Enlil-kudurri-usur fifteen years or so after Tukulti-Ninurta died at the hand of assassins in his eponymous city. Tukulti-Ninurta wrote a letter to the Hittite king, thought to be Suppiluliuma II, four fragments[i 14] of which were discovered at the site of excavations of Ḫattuša in the 1930s. It was dated to the limmu year of Ilī-padâ, in the latter part of Tukulti-Ninurta’s reign. In it, he recaps the genealogy of the recent Kassite dynasty, mentioning Kurigalzu II, Kadašman-Enlil II and Kudur-Enlil then apparently castigating Šagarakti-Šuriaš, the “non-son of Kudur-Enlil”, and his sons, one of whom, Kaštiliašu, had provoked the war by his dastardly pre-emptive strike against Assyria. In one place, the sons of Šagarakti-Šuriaš have been killed, almost certainly by none other than Tukulti-Ninurta himself. He then makes reference to a “servant of Suhi”, where Suhu is a region of northeast Syria, and Itamar Singer proposes this individual to be Adad-šuma-uṣur, the implication being he was a foreigner, not of the royal stock and consequently unqualified for office. The Ilī-ḫaddâ mentioned is none other than Ilī-padā, the viceroy of Hanigalbat, Ashur-nirari’s distant relative (sharing a common ancestor in Eriba-Adad I) and the official for whose limmu year Tukulti-Ninurta’s letter to the Hittite king had been dated. The letter was carefully copied and preserved in the library at Nineveh. Grayson speculates it was kept to “goad” the Assyrians to vengeance. […The officers of Assyria] seized [Enlil-kudu]r-usur their lord and gave (him) to Adad-šuma-uṣur. …the peop]le of Karduniash who had fled to Assyria …they gave [to Adad-šu]ma-uṣur. — Walker Chronicle (ABC 25), tablet BM 27796, obverse, lines 5 to 7, in the British Museum. Following this famous victory, a “son of a nobody, whose name is not mentioned” exploited the chance to enthrone himself in Babylon, so a revolt was propagated and Adad-šuma-uṣur took the city and his place in the Kassite dynastic list. The events were captured for posterity in the Adad-šuma-uṣur Epic,[i 16] a late Babylonian historical literary work where a rebellion of officers and nobles is caused by the neglect of Marduk and Babylon. The penitent king confesses his sins to the god and restores his temple, Esagila. The end of Enlil-kudurri-usur’s reign is dated 1193 or 1183 depending on uncertainty about the duration of his successor’s, Ninurta-apal-Ekur’s, rule, three or thirteen years. As a son of Ilī-padā, Ninurta-apal-Ekur had exploited Enlil-kudurri-usur’s demise to seize power in Aššur. [i 17] He had “(come) up from Karduniaš”, where he may conceivably have been the last Assyrian governor of Babylon, as his brother, Mardukīia, was governor of Katmuḫi. The length of his reign does rather crucially determine the likely date range for the beginning of Adad-šuma-uṣur’s thirty-year reign, because there is no datable event that takes place at the beginning, such as the passing of a preceding monarch. The interregnum between Babylon’s fall to Tukulti-Ninurta and its conquering by Adad-šuma-uṣur had been at least twenty two years and perhaps even more than thirty years. He was succeeded by his son, Meli-Šipak, who was curiously reluctant to mention his filiation to Adad-šuma-uṣur in his own inscriptions. ↑ 1.0 1.1 Letter to Aššur-nirari and Ilī-ḫaddâ, tablet K. 3045, published as ABL 924. ↑ King List A, BM 33332, column 2, lines 8-11. ↑ 3.0 3.1 3.2 3.3 Chronicle P, (ABC 22), BM 92701, column 4, lines 8 and 9. ↑ Walker Chronicle, ABC 25, BM 27796, lines 2-4. ↑ Stamped brick CBS 8643. ↑ B. 69 formerly Div. 304. ↑ B. 70 formerly Div. 305. ↑ Tablet Museum reference IM 85543 excavation reference U 7787d, Certificate of sheep plucking. ↑ Tablet Museum reference IM 85482, excavation reference U 7787e, and UET V 259, terms of reference for trial by ordeal. ↑ IM 85515, three cases of cattle theft, and IM 85514, a second document relating to case 1. ↑ Letter from Tukulti-Ninurta to Suppiluliuma II, Kbo 28.61–64. ↑ Literary letter from Elamite King to Kassite court, tablet VAT 17020. ↑ Adad-šuma-uṣur Epic, BM 34104+. ↑ Synchronistic History, ABC 21, tablet K.4401b, lines 5 to 8. ↑ s. M. Luppert-Barnard (1998). K. Radner, ed. The Prosopography of the Neo-Assyrian Empire, Volume 1, Part I: A. The Neo-Assyrian Text Corpus Project. pp. 37–40. ↑ 2.0 2.1 2.2 2.3 2.4 2.5 2.6 J. A. Brinkman (1976). Materials and Studies for Kassite History, Vol. I (MSKH I). Oriental Institute of the University of Chicago. pp. 19–20, 427, 315, 89–94, 443 and 445. ↑ 3.0 3.1 3.2 3.3 3.4 C.B.F. Walker (May 1982). "Babylonian Chronicle 25: A Chronicle of the Kassite and Isin II Dynasties". In G. van Driel. Assyriological Studies presented to F. R. Kraus on the occasion of his 70th birthday. Netherlands Institute for the Near East. pp. 398–406. ↑ 4.0 4.1 4.2 Itamar Singer (2011). "KBo 28.61-64, and the struggle over the throne of Babylon at the turn of the Thirteenth Century B.C.E.". The Calm before the Storm. SBL. pp. 385–404. ↑ J. A. Brinkman. "Date formulae used under the Kassite dynasty". MSKH I. pp. 397–414. ↑ O. R. Gurney (1983). Middle Babylonian Legal & Economic Texts from Ur. British School of Archaeology in Iraq. pp. 176–77, 52–55, 177–179, 121–125. texts 72, 11, 73, 43, 44. ↑ I. E. S. Edwards, ed. (1975). Cambridge Ancient History, Volume 2, Part 2, History of the Middle East and the Aegean Region, c. 1380-1000 BC. Cambridge University Press. pp. 288–289. ↑ Shigeo Yamada. "Tukulti-Ninurta I's Rule over Babylonia and its Aftermath - A Historical Reconstruction". Orient. 38: 153–177. doi:10.5356/orient1960.38.153. ↑ Trevor Bryce (2003). Letters of the great kings of the ancient Near East: the royal. Routledge. p. 11. ↑ Peter Stein (2000). Die mittel- und neubabylonischen Königsinschriften bis zum Ende der Assyr erherrschaft. Harrassowitz Verlag. p. 147. ↑ 11.0 11.1 A. K. Grayson (1972). Assyrian Royal Inscriptions, Volume 1. Otto Harrassowitz. pp. 137–138. ↑ Jonathan Z. Smith (1988). Imagining Religion: From Babylon to Jonestown. University Of Chicago Press. p. 92. ↑ D. J. Wiseman (1965). Assyria and Babylonia c. 1200-1000 B. C., Volume 2, Part 31. Cambridge University Press. p. 11. ↑ According to the Assyrian King List, 82nd king listed entry. ↑ J. A. Brinkman (1999). Erich Ebeling, Bruno Meissner, ed. Reallexikon der Assyriologie und Vorderasiatischen Archäologie. Walter De Gruyter Inc. pp. 50–51.